Cursed by a queen scorned, all the men cease to exist across the Five Realms, so their daughters must stand in their place at the throne. 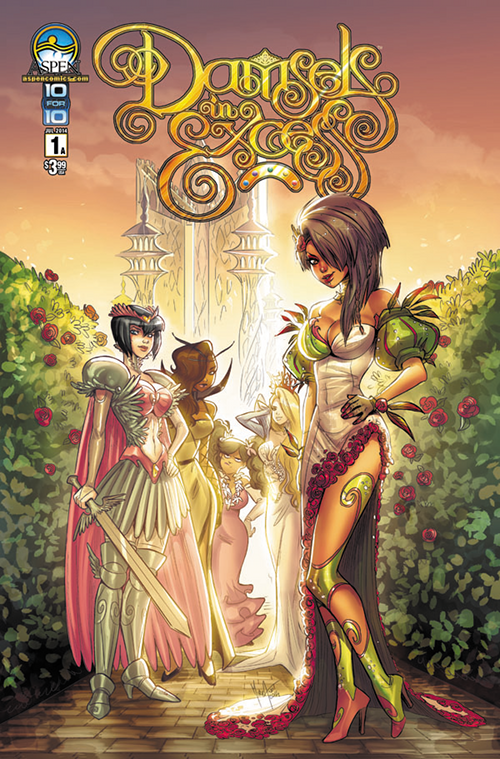 But the question remains whether these five princess have what it takes to save their kingdoms. As someone who has gone through the Damsels titles recreationally (as opposed to religiously like I do with most of my comics) whenever the whim struck me for something less superhero-y and more light in content, the decision to pick up Damsels in Excess with my usual pull is one that I’m glad I pursued. Just the tone of the story, already lines it up to be one of my favourite Damsels stories yet. From the premise of putting five princesses together in a world where no men existed, I knew I would love it. The more cartoonish style of Andolfo keeps the story light and fun and makes the characters lovable even though at this point there’s little truly known about each of them. But the characters so far are simple enough, carrying out popular female tropes so every reader has one to connect to; there’s the conceited blonde with the queen bee attitude, the wise and soft spoken who is connected spiritually with her land, the tough warrior princess, the diva who doesn’t want to deal with all these personalities, and of course the youngest—who seems to be the main storyteller. Naturally based around all this, their relationships around one another are good for a few lighthearted laughs and the real story from this issue stems from the backstory of how the lands became a place where only the women survived. And yes it’s a female oriented story, but it’s not one that comes from a hateful place, nor is it radically feminist. There are no proclamations that all men are inherently evil and all deserve to die. But this backstory does come from a queen who had her heartbroken. While she may think poorly of the male race, her views are not reflected on any other character, so as trope-y as Damsels may be at the beginning of its tale, it seems that as we learn more about the characters, they’ll certainly develop more multidimensionally. What can I say, I’m a sucker for adorable girls in beautiful dresses with fierce attitudes. But so long as comics remain a part of the comic industry and I am entertained by the fact, the creator’s job is done here. But seriously. As simple as everything sounds, there’s a good heart underneath all of the work put into this series creation and once you start reading it, for some reason or another it hooks you in. There is absolutely nothing not to love about what’s been put into this issue you know continuing forward is just going to be a ride.